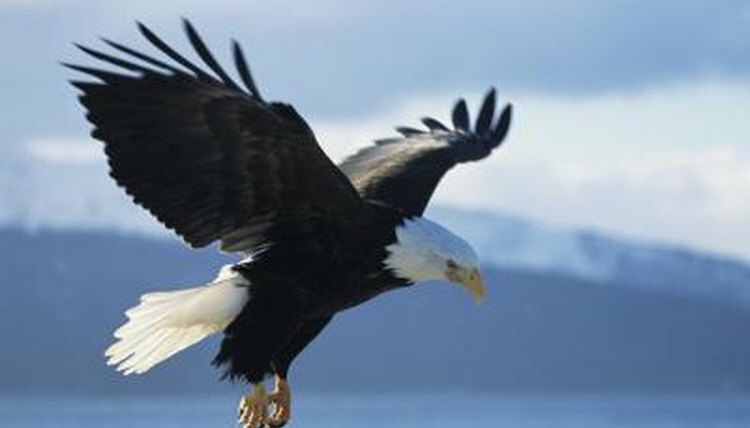 The national bird of the United States, the bald eagle is found only in North America. The aerodynamic bald eagle (Haliaeetus leucocephalus) silently dives from the sky and snatches fish from the water. He conserves energy by gliding on rising warm air currents called thermals and flies at altitudes up to 10,000 feet. When you see several eagles riding the thermals as a group, you're viewing a "kettle" of eagles. The bald eagle's body is covered with 7,000 hollow feathers. Bald eagle feathers are lightweight -- 30 weigh about the same as a penny -- flexible and strong. Interlocking layers of feathers contain insulating air pockets; the bald eagle rearranges his waterproof feathers to space out or draw together the air pockets, regulating body temperature. Haliaeetus leucocephalus molts once a year, unlike most birds, who molt several times a year. The 8-foot wingspan of an adult bald eagle is a majestic sight. The bird can reach 35 miles per hour during level flight. Angling his head, wings and tail, he takes maximum advantage of the wind, diving at up to 75 miles per hour with the wind at his back. The bald eagle's wing tips have gaps between the flight feathers. He adjusts his wing slots to sustain his flight pattern and ensure precise movements. The bald eagle moves his tail from side to side, and up and down. During flight he spreads his tail feathers, increasing the surface area; he glides and soars utilizing his tail to increase the effects of updrafts and thermals. As the bald eagle dives, swoops or brakes, he steadies himself with his tail. The bald eagle's bones are hollow and virtually weightless. An adult eagle weighs between 8 and 16 pounds, the male lighter than the female. His bones weigh only about a half-pound, or 5 percent to 6 percent of his total body weight. The eagle's beak, talons and feathers are made of lightweight keratin. The bones' light weight factors into aerodynamics, because weight determines how much lift is necessary to gain altitude relative to volume or displacement -- relative to how much space the bird takes up -- as well as determines maneuverability at speed. The juvenile bald eagle reaches adult size when he's 2 months old. He makes his first flight about a month later but returns to the nest, where his parents will continue to care for him for another four to twelve weeks. The bald eagle spends the first four to five years of his life in training, learning to hunt, strengthening his flight muscles and perfecting his flying techniques.